Maridini Cooperative - now known as the Global Women's Water Initiative, MOYO Branch - will build 8 tanks and 10 biosand filters. They have completed their toilets and are waiting for the rest of the BPN grant to finish the 8 other tanks and start their BSFs. Waiting for other implementing partner (KWDT) to provide updates on their projects so the balance of the grant can be issued. Global women’s water initiative Moyo is a CBO situated in Elenderea Village Moyo Town Council and trained on wash programme by Global women’s water initiative californice in Kisumu June 2013. Moyo Boys Primary is one of the schools which received Rain water harvesting tank built by GWWI-Moyo in June 2012, the school is mixed both girls and boys with the total of 948 pupils. The school has pit latrines for both boys and girls, due to the population of the school, the pit latrines fills quickly. GWWI-Moyo will construct 4 stanches of VIP Latrines and girls wash room. Constructed RWH tank with capacity of 15,000 litre for Moyo Boys Primary School. 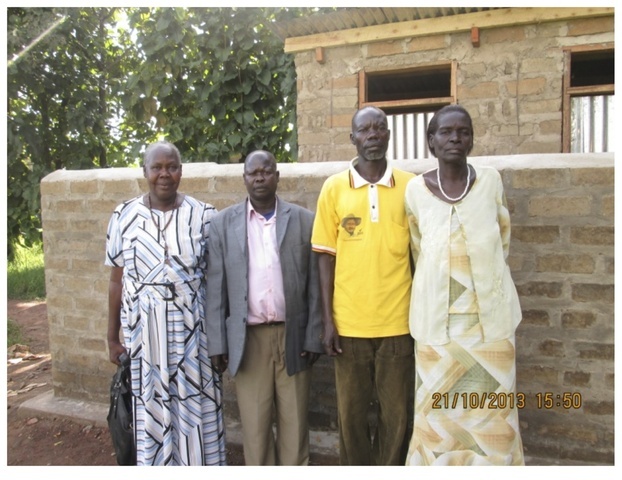 Beneficiaries : Teachers, pupils and Community. Availability of VIP latrine for pupils teachers and Community will reduce worm infestation and improve hygiene due to availability of water in the school pupils will not go looking for water during period of learning. •	Made ISSB block using murrum, river sand cement 7.1.1. with square machine. •	Meeting with head teacher, PTA and SMC and teachers. •	Identification of site and digging the pit. •	Making of slab which was made to set for 7 days. •	The slab was lifted and put on the pit. •	Doors fited and PVC put in place. 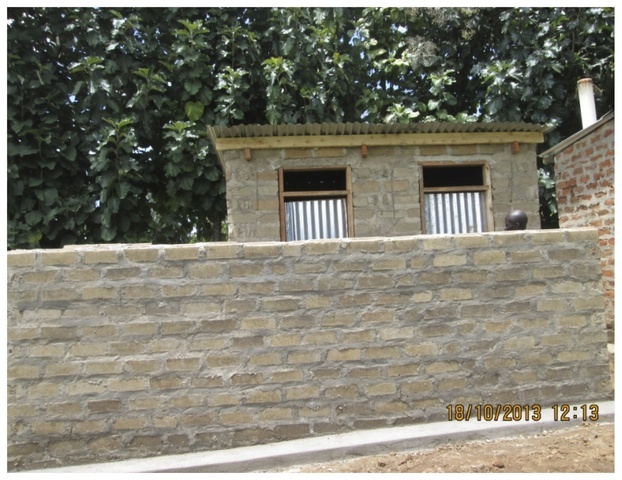 •	The VIP latrine handed over to the PTA, SMC & Teachers by GWWI-Moyo. •	4 stances VIP latrine and girls wash room. 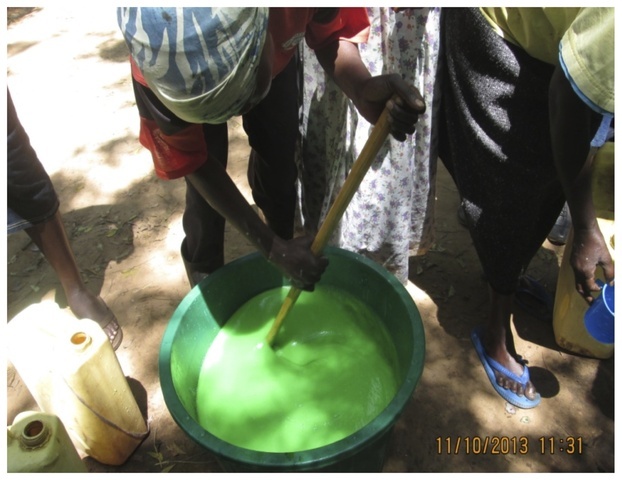 •	Liquid soap made in 3 groups and distributed to women groups and school. •	Handover of project to school management. GWWI Moyo helped Moyo Boys Primary School to select sanitation Committee to maintain hygiene. There is already water Committee in place to maintain hygiene and the project properly. •	GWWI- Moyo has initiated self help saving and credit group. •	Moyo self help savings and credit group was established under GWWI-Moyo on 20th Jan 2013. The objective is to assist members in their daily activities as the individual members need arises. •	The members contributed a sum ranging between one thousand shillings and five thousand shillings only every two weeks. •	Members are allowed to borrow from the savings and pay back at the end of three months period. •	Social welfare is also borrowed but paid back at the end of every two weeks. •	Currently we have 30 members and our savings is 2,300,000/= shillings which is circulating among the members. •	Our social welfare is 660,000/= shillings which is also circulating among our members. •	Moyo Boys Primary School is one of the schools which have maintained their RWHT very clean and properly. •	Much cooperation with school management and GWWI-Moyo. •	Our appreciation goes to Gemma Bulos our director from California for her tireless support to GWWI-Moyo. •	Our Ugandan Coordinator Hajira Mukasa and Engineer Godliver Busingye for their support whenever needed. •	Moyo Local Government has always supported us in every way we are grateful. •	GWWI-Moyo you are great, I am proud of you. •	Materials for making soap product is not available and we shall not be able to make it though, there is demand. •	During the implementation, there was too much rain which delayed our activities. •	Some of the challenges can be managed as they arise and we always work for success of our community. All the stake holders who support us morally, financially. We always want to work with people to develop our District. 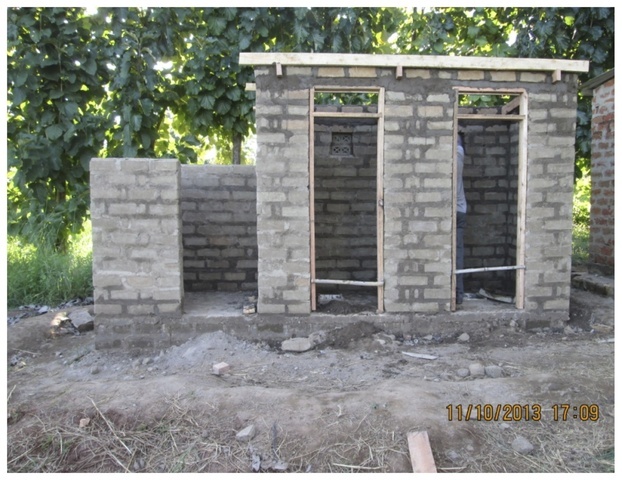 ACCOUNTABILITY FOR CONSTRUCTION OF VIP LATRINE 4 STANCES WITH GIRLS WASH ROOM. - Made one long pit - separated by 5 feet with a wall in between. - when constructing - the district intelligence security officer (DISO) visited - good advocacy to come on site while working. During Comfort and Godliver's travel back from Moyo, their bus was in an accident and fell off the side of the road. Journey took 2 days. There was only a primary school closeby- no trading centers. They were bruised but safe. GWWI early next week either Monday or Tues. Will build 4 VIPs and teach other women to make soap. Comfort waiting for soap material delivery from Rose (GWWI coordinator in Kenya). School strike in Uganda. All public schools closed. they said even if the prices of materials are high, they will get community contribution to build the toilets if the GWWI seed grant doesn't cover it. GWWI Moyo is still mobilizing resources and getting community support to build 4 toilets in a school (2 for boys and 2 for girls) as a requirement for their participation in the GWWI training program. Ocular inspections of GWWIM projects. All tanks functioning properly. All users happy with technology, but know that it isn't enough to supply water throughout the year. Modifications made at mosques because of the building architecture. See slide show for further updates. Mid-term report enclosed. 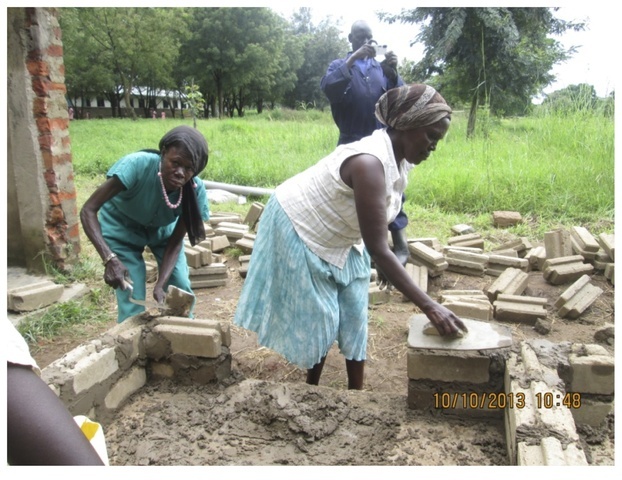 2 more tanks built on an additional school in Madulo and a mosque in Maringu-Lefori. 2 tanks built at a school in Homing Dove Primary School in Moyo Town Council, between Marinyo and Metu quarter village. See attached report. Also attached is a future work plan. Construction and training scheduled for early May. Begin planning the RWH/ISSB tank construction and training to build first 2 tanks at schools in Congo village in Moyo, border of Sudan. Hiring and engaging Godliver Businge, GWWI Head Tech Trainer to provide support as they construct the system to help Angella and Martha build their technical training skills so they can train others on their own. GWWI Moyo sought out to offer WASH seminars around the town to encourage good WASH practices, show how water is contaminated through the F-diagram and water testing, and promote the rainwater harvesting system with ISSB tank. Between the time this proposal was submitted and the issuance of the grant, Marindi Cooperative opened a new entity called the Global Women's Water Initiative Moyo Branch. Marindi Coop realized the importance of the Women and Water Entrepreneurship when the 2 women, Angella Tassas and Martha Adong returned from the GWWI training with useful knowledge and technologies to address their local water issues. With full support from the cooperative and local leaders, 30 women came together to form GWWI Moyo with the sole intention of building water and sanitation solutions to their communities to improve community health and empower women. 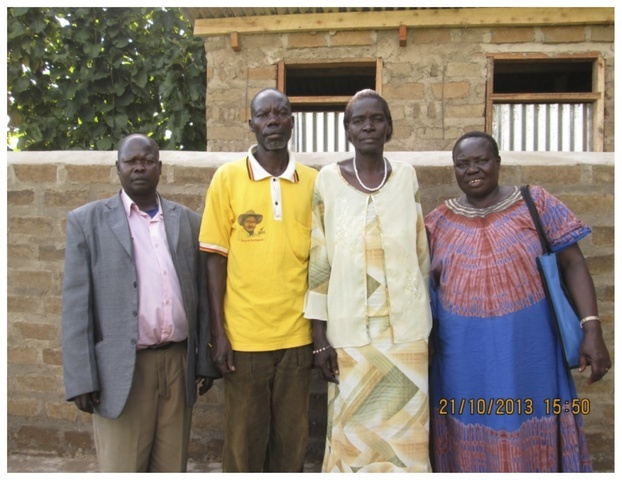 They received their first grant from GWWI/BPN in January 2013.